Salou is a popular family seaside resort in Spain that is situated 111 Km South West of Barcelona. If you are looking to plan your trip to Salou in Spain this site has all the information you need. This Salou tourist guide has been written by locals ensuring your information is always bang up to date and packed with insider tips. Salou is a fabulous destination for anyone searching for a little Spanish sun, sea and sand. Salou is a popular destination for families and is readily accessible via Reus International Airport which is only 15 km away. You also have the famous Port Aventura theme park a short drive away and if you fancy a little more water adventure you have the PortAventura Aquatic park right next door to Port Aventura. You'll find reviews of all these attractions here on this website. 1. Look at the site navigation bar at the left of every page on our site. 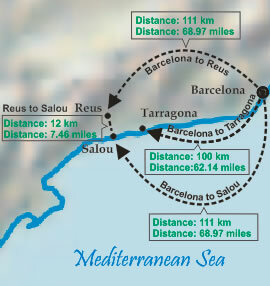 All of the main topics associated with organizing your trip to Salou are there. Simply click on any link to be taken to more detailed information. 2. A very effective way to find answers is to use our site search tool which you will see at the top of every page on our site. Simply type in a few keywords associated with Salou tourist information you wish to find and click the Go button. You will then see a list of pages that are related to the keywords you typed in. 3. At the foot of many information pages you will see "Related Pages" links. This makes it simple for you to find pages with a related theme to the one you are viewing. We hope you enjoy our site to plan your holiday to Salou. Let us know if you want to see any additional information or if you have any questions that are not answered on the site.